A concrete pump is a machine used for transferring liquid concrete by pumping. 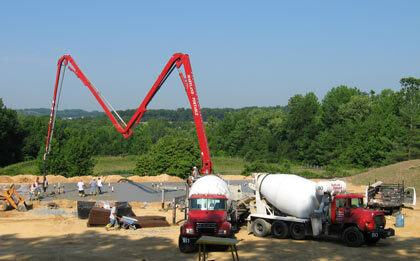 Dart Services' Concrete Pumps are attached to a truck or longer units are on semi-trailers. It is known as a boom concrete pump because it uses a remote controlled articulating robotic arm (called a boom) to place concrete accurately. Boom pumps are used on most of the larger construction projects in Saskatchewan as they are capable of pumping at very high volumes and because of the labour saving nature of the placing boom. They are a revolutionary alternative to truck-mounted concrete pumps. The second main type of concrete pump is either mounted on a truck or placed on a trailer, and it is commonly referred to as a line pump or trailer-mounted concrete pump. This pump requires steel orflexible concrete placing hoses to be manually attached to the outlet of the machine. Those hoses are linked together and lead to wherever the concrete needs to be placed. Line pumps normally pump concrete at lower volumes than boom pumps and are used for smaller volume concrete placing applications such as swimming pools, sidewalks, and single family home concrete slabs and most ground slabs. Benifits of Our Concrete Pumping Service in Estevan & Weyburn. You can discharge more ready-mix trucks in less time using a concrete pump.